The Soho showcase for great Peruvian food, and not just ceviche but grilled meats, skewers, and much more - including an excellent and very popular bar. The Peruvian party hasn’t stopped on Frith Street since Ceviche showed up: Martin Morales’s restaurant-bar (and his joie de vivre) seems to have struck a chord with Londoners. Ceviche may not quite take you to Cusco, but friendly South American staff provide more warmth than Inti, the Inca sun god. Pisco, the South American brandy, is the deity bowed down to behind the bar, though. Sample it in one of the best Pisco sours you’ll find in the capital, or knock back the Pasion de Ceviche if you’d prefer the hefty spirit tempered with honey and passionfruit puree. Cocktails alone are worth a visit, but the food is just as impressive. 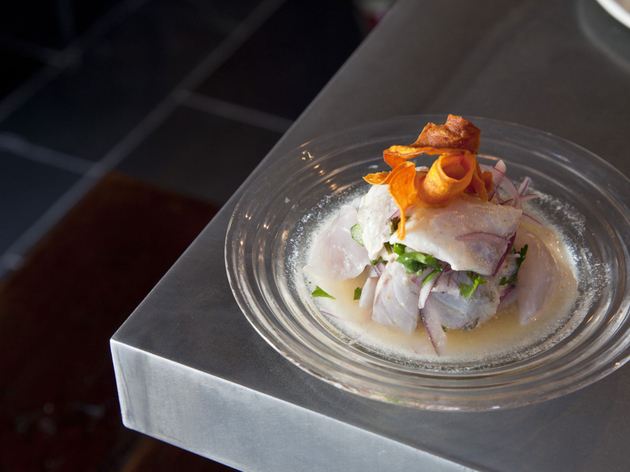 Obviously the star of the show is ceviche, with the don ceviche (£9) ordered by many a diner – these fleshy cuts of sea bass soaked in tongue-tingling leche de tigre are as famous as Francis Bacon in Soho. Order with corn cakes, fresh and vibrant salads packed with avocado and lightly spiced chicken dishes (guinea pig is yet to make an appearance!) and you’ll be feeling higher than a gap-year student on a Peruvian journey of self-discovery. Ceviche. That’s us and that’s our dish. Everything you need to know about Peruvian food is in it. We’re obsessive about how long we marinate it for, the kind of lime we use, the kick from the chilli (not too much), when we add the salt and how it’s ground... it all matters to us. A lot. I felt a bit disappointed after my last visit at Ceviche Soho. I first visited Ceviche years ago when it had just opened and I think that the restaurant has now lost much of the good quality it had. I found the food to be overpriced and just not as good as I remembered. It's a shame but I think that Ceviche has lost it's quality compared to other Peruvian restaurants in London, even those part of the same Ceviche group. I stumbled across this delight with my friend as we were trying to pick somewhere to go for food that would be pretty quick. The menu is based around a lot of fish but plenty of meat & veg options too. We took a seat at the bar as the main seating was full, we were advised to order 2 or 3 dishes each. We opted for 2. I went for a corn & avocado cake followed by a fillet of beef with chips and tomato with red onion. I really didn't know what to expect from either dish (both off the classics menu) but the corn cake was my first surprise, it was almost like an actual savoury cake. I'd say rather large in size for tapas and certainly worth the money. Next up the fillet of beef and wow was this tasty, I adored the sauce that it was marinated in, almost peppery but the key highlight was how tender and juicy the beef was. When can I come back!!! This is probably my favourite restaurant in London. The atmosphere, the presentation and taste of food, the decor - it's all amazing! The food is fresh, light and delicious. The portions are served tapa style - small amounts that you can share with friends. If you like a varied cuisine, try new tastes, and enjoy great food and drinks with friends than this is place is for you. P.s - Don't forget to order a pisco sour when you arrive! Come here for the pisco sours, the food? Nah! You can make their stuff at home if u have the basics of lime, salt and olive oil! Really bold flavours, not for the weak of palate! The pisco sours were excellent and the combination of Peruvian dishes are tapas in style and it's well worth asking the waiting staff's advice. It's not the cheapest, but well worth a visit especially if you are coeliac. I have to admit ..... I was a little "mmmm" about coming here. The problem is too many places in London are overrated and I was afraid Ceviche would fall into that basket. I . was. So. Wrong! .... I found the menu refreshing and vibrant! Exciting and inviting! Everything we ordered that day was full of colour and most importantly flavour!.... What I do recommend is that you indulge in a cocktail or two as they were simply splendid! You won't spend a fortune either so you can't go wrong. 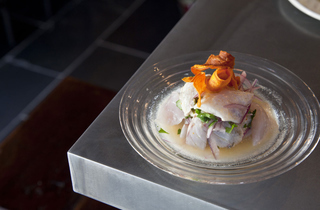 Ceviche Soho satisfies London's current obsession with all things Peruvian. They offer great standards like ceviche (obviously), corn cakes and pisco sours. My favorite dishes were the feta and corn cake and the tempura cauliflower with a tahini dip. We had six dishes to share and just water to drink and the bill came to a meager £40 including tip! They take reservations, which I would definitely recommend because even on a Monday night the restaurant was full from 6:30 onwards. The atmosphere was quite cramped and I found I was having to yell to my friend just across the table to be heard. This definitely isn't a place for a relaxed and leisurely meal, but for some great food before or after drinks in Soho. Awful experience... microscopic portions... over-priced! (If you ever order the seabass, be sure to bring a pair of tweezers with you so you can actually find it). Disappointing. This is my favourite place for peruvian food! Or at least the chain (I prefer the Old Street venue as there is a little more space and privacy). And even my peruvian friends agree. You get food as good as or even better than one-michelin starred Lima, and you don't pay half as much. Getting a table can be difficult but well worth the wait. The ambience is lively and fun and the service is amazing even though the staff are clearly swamped and are trying to work in such a tight space. Don't be surprised if you end up talking to the next table (who are so close the practically are on your table). Don't forget the amazing pisco sours! they also do a masterclass on making these amazing drinks but I havent been able to attend one yet... I will though! This is 100% peruvian, just like it is in my hometown, Lima. Just as good, not to be confused with spanish ior mexican, it's the real deal. Really good Ceviche. The waiter will probably correct you if you use the term tapas! “Tapas are from Spain” and here we are in a super nice Peruvian place. I discovered Peruvian food with Ceviche and everything is so good. Of course the classic ceviche is amazing; it can make someone like fish; but all the meat or seafood are really good quality and well-cooked. Don’t be afraid of the white egg and try the Pisco Sour, the Peruvian national cocktail, you won’t regret it! My favourite dish remains the dessert; a coconut panna cotta! If you did not have tried it yet, book not! Really lovely place, located right in the heart of Soho. From the minute you walk in you can feel the relaxed atmosphere of the place, The staff is very attentive and kind, going through all the options with us and being very patient with our questions regarding foreign ingredients. The food for the most part was really good, yet there was an agreement amongst our table that the prices were too high for the food. The quality was very good, but the quantity did not justify the prices. If it were located in any other place in London I would probably give it 3 stars, but as it is central London high prices are to be expected. Beautiful presentations! Great staff! The meat dishes were amazing. (Beef heart) The seafood was a bit strange looking and heavy on the mustard/wasabi/horseradish flavours. It's served a bit like tapas so it gets expensive quickly. Fun experience but left feeling hungry because of my budget. Haven't been for food here but really want to- the place is super pretty and the drinks were amazing. Went for a few late night cocktails and the bar tender made them specifically to our tastes. Staff were really attentive and the the food going past looked delicious. Really nice vibe too, seemed quite casual but still buzzy. Great ceviche! This is a really authentic place is if you are craving for ceviche. Not all Peruvian dishes are in the menu, but that's okay. It's a great improvement for the Latin scene in London. I've visited Ceviche many times and have loved pretty much everything I've had. The cocktails are strong and authentic, the fish is always super fresh and paired with amazing marinades, sauces and flavors. As many other reviewers have commented, the food is presented beautifully. The only aspect I don't like is how dark and small the Soho restaurant is. I try and visit the Old Street branch as it has pretty much the same menu but is so much larger and airy. A little 'hit or miss' with some dishes. Be prepared for raw fish when you don't expect it! Good service and a busy vibe. Glad we tried it but wouldn't return as not really my taste of food. Beautiful presentation of food, the menu is tapas style so small portions which are fairly expensive considering the quantity but that is made up for in taste and quality. We had the Tuna, Don Ceviche (Sea Bass), Anticucho de Corazón (Beef Heart), Pollo en Panca (Chicken Thighs) and Ensalada de Quinoa. That’s also in order of best to middling! The tuna and seabass were incredible, tuna had what looked like fish roe but were actually little wasabi pearls that delivered this lovely burst of flavour with every bite. It’s a lovely place to come for a good class meal that is served quickly, with helpful staff. Ideal for pre-theatre! Some dishes were astonishing (though many were not). As for the pisco, there's a reason why you've never had it before. The ambience was just a bit too cool for me to be honest. This place is one of the most delicious, interesting and taste bud awakening places ever. If I could eat there every day I would! I was a bit off put by the sounding of some of the things on the menu, and might have not chosen them on any normal day, but as the whole menu seemed quite adventurous, I tried things I might have not before and didnt regret it. Brilliant, brilliant place that's fun as fun can be. The flavours from the ceviche are incredible and the cocktails lovely. A perfect spot for an informal lunch or dinner, and will definitely impress a date. Amazing lip smacking freshness, with bold flavours and colourful plates to satisfy your taste buds. Went to Ceviche several times but favorites times are always when we sit at the bar talking to the friendly bartenders while they whip up off-menu cocktails according to your mood. The food is tapas style so small portions but all very tasty. The venue has a great atmosphere even when its almost empty. The staff is very accommodating, we had various people show up late, but we could still order and eat before the "whole party" was there, which is rare in London. The food is good too, however the portions are tiny and the prices are quite steep. So definitely proceed with caution. Just love the fresh seafood plates they offer, the atmosphere and service. Their cocktails are amazing. Great vibe in the always very busy restaurant. A fantastic & authentic experience at Ceviche is always guaranteed ! Love the team, the food & the ambience. This is truly a jewel in Soho where the Pisco will enchante you. Just go - you will not regret it! We've never been disappointed since we first had a meal there when it was newly opened. Our favourite London restaurant! I had an amazing meal last night. The food is fresh and delicious. I highly recommend going here for a snack, dinner, or maybe just drinks. The Piscos are outstanding. My favourite dishes were the lomo, beef heart, the little corn bits at the start too. My favourite ceviche was the don ceviche. When I eat out, I love to tast everything and Ceviche allows you to taste a few things without breaking the bank. The atmosphere is buzzy and cool, but not pretentious which really rocks my world. Enjoy guys! What a treat to find Peruvian cuisine so well represented here in London. Ceviche is a warm restaurant filled with personality - feels like it has already been there for years. I can honestly say that I haven't eaten that well in a long time. The food is so full of taste and I found myself being adventurous with different foods without even realising! I never knew octopus was that tender and why didn't anyone tell me that barbecued cowheart is so delicious?! Friendly waiters set the tone for a lovely family get together. Being Peruvian food lovers we got exactly what we excpected! Nice and very local Soho restaurant with some authentic Peruvian dishes. Ceviche and pisco tastes very authentic (I just got back from Peru) however beef tonge was not tender enough. The stuff was friendly and relaxed but the bill was a bit higher than in other local places. Overall, I would definitely come back for an afternoon drink and Ceviche! never tried peruvian food before - loved it !..not normally a raw fish fan but the sea bass was sublime ..our group of four, my partner, her best friend & boyfriend who celebrated best friend's 30th b day there, also sampled all the desserts - delightful, as was the service - will all be going back..soon ! i love the location and the staff. The staff are most welcoming, and thanxs to them, i forgot about the let down of the food and drink. the portions are far too small, and that was not ceviche. the leche de tigre from the ceviche was far from what it should be, it tasted like water in salt and pepper, and it def didnt have the right colour, it looked far too dark and bland. The pisco were not the best either. the Chicha pisco was far too strong. I think they need to just work a bit on the balance of booze. too much booze in a cocktail does not mean is much better, and that was the case in this situation. Im sure within time Ceviche will be a great place to hang out and enjoy good Peruvian Food, but at the mo, I dont believe they are there yet. I absolutely love this place. The menu is so refreshing compared to anything I've tasted in London. Each dish is such a delight, the portions are not big enabling you to order a few dishes per person (they recommend four) which is my favourite way of eating. The Don Ceviche and Corazon anticucho blew me away. Although Pisco is the only spirit you'll find behind the bar, you don't feel at any point that you're freedom of choice has been compromised. I sampled the Pisco Sour and Soho cocktails, both exceptional whilst completely different in taste. London finally has a restaurant which Peru can be proud of. Fantastic restaurant and completely unique in London - the team are are top standard and the atmosphere is infectious. Definitely worth checking out with a group of friends. We had a family sunday lunch at Ceviche today for mothers day. It was delicious and a really special lunch for our family, Dad enjoyed a Pisco sour, Mum enjoyed the Ceviche, I loved the Duck and the kids loved the Chicha Morada drinks and the Lucoma Ice cream. Thanks a million to all the lovely staff. Ceviche had a good energy to it. The front of house was particuraly welcoming. Peruvian cuisine is somewhat new to us brits and Ceviche im sure will be a champion of this wonderfully rich and diverse cuisine. The ingredients where fresh. The deserts where delicious. Pisco and Chicha Morada are really worth trying out. The artwork on the walls is fun and quirky. Being a vegetarian they had a well balanced menu. I look forward to going back. Ceviche is buzzing with activity, a friendly staff and lively music - perfect ambiance! Try the Pisco Soho - - heaven! Food is colourful and flavourful and fresh. Unique menu with beautiful combination of ingredients. Must try it! Went to CEVICHE yesterday for work lunch - really amazing food. As a Peruvian I was hoping for a high standard - and we got it! Ceviches were great, but the prize goes to the octopus anticucho, really good. Also, the pisco sour was just like back home and with a kick. Will be coming back often. All my other friends loved it and the bar has a great vibe to it. Highly recomended. Food quality is good, but extremely pricy. The sizes of the dishes are very small. The restaurant concept is similar to Wahaca but the prices are a different story. About the service, although waiters were friendly the manager kept telling us to be quiet when actually we were just enjoying a normal night in a Soho restaurant. This place is INCREDIBLY expensive (it's more like £120 for 2 people with drinks, not 80£ and the dishes are tiny. The food is tasty but expensive. The other issue is that despite creating a nice, boisterous vibe the manager was quite rude with a group of just 6 people with any laughing/talking. If you want people to spend money and you create a nice vibe, then let people enjoy the atmosphere!!! nice flavours but extremely expensive and the worse is that you don't realised until the bill comes, you have to go with at least a sandwich already in your stomach...the tapas concept may be a good idea to introduce Peruvian food to some (although nowadays many people knows) but the prices are high to pay....some of the main dishes are not set up like in peru and you have to pay extra for things to have them complete...Lomo Saltado without the rice....come on!!! I tried this restaurant with some friends - great location, great atmosphere, great tasting food and great Pisco Sour, however this is definitely more of a bar with light bites then a restaurant. And for the size of the portions it is expensive - £11.50 for an entree sized Lomo Saltado without rice. I spent £35 and I was left hungry. The other new Peruvian restaurant in Islington called Tierra Peru is definitely better value if you are looking for a meal and the menu has much more variety. As peruvian I had very high expectations for this restaurant, came with 7 other friends which half of them had visited Peru with me so they know how good our food is (and other peruvians too). We weren't dissapointed! the Pisco sours definately the best in London! they compete with some in different restaurants in Lima. The food was very tasty - the best probably the arroz con pato, anticuchos and the quality of the meat (lomo saltado), things they probably need to improve is the tequenos and tiradito (should be more creamy). The staff was really friendly but still seemed a bit nervous which is understandable as they are still going through the soft opening until March 12, but at least they were trying to be nice, none of us experience 'the bad behaviour' mentioned below. The only negative comment is the main dishes sizes are not aligned with prices, (choclo - too expensive and rice is extra for lomo saltado) maybe they should check the pricing of Wahaca as an example as we though 50£ pp was a bit steep... Overall we had a great time and food was awesome!! Our London friends have already been there twice this week! the quality of the food is awesome. The size of main dishes is not aligned with prices. You end up paying the price of main size dish for the size of a sample or tapa. The service seem to still be in training but with a good attitude. Again is difficult to price an informal environment at 50 P/p but the the food in really really good.